CHARLES LIU is an astrophysics professor at the City University of New York's College of Staten Island, and an associate with the Hayden Planetarium and Department of Astrophysics at the American Museum of Natural History in New York. His research focuses on colliding galaxies, quasars, and the star formation history of the Universe. He earned degrees from Harvard University and the University of Arizona, and held postdoctoral positions at Kitt Peak National Observatory and at Columbia University. 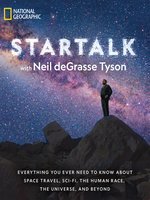 Together with co-authors Robert Irion and Neil Tyson, he received the 2001 American Institute of Physics Science Writing Award for his book "One Universe: At Home In The Cosmos." More recently, he is the author of "The Handy Astronomy Answer Book," now in its third edition. He and his wife, who is way smarter than he is, have three children who are also way smarter than he is. JEFFREY LEE SIMONS is the social media director of StarTalk Radio. When he's not busy engaging with the greatest fans in the universe, he's also a writer. He is the author of Spirit In Realtime, the first installment of his near-future, virtual reality/cyberpunk young adult science fiction series. Jeffrey is also the co-author of the cause-related marketing handbook, Making Money While Making A Difference, with Dr. Richard Steckel, and the author of two works with noted artist Viktor Koen: Lexicon: words and images of strange and Toyphabet. He has a BA in Literature from Georgetown University. He lives in New Jersey with his wife, daughter, and four cats.